RGB / Hex color picker plugin for Mac OS X system color panel. 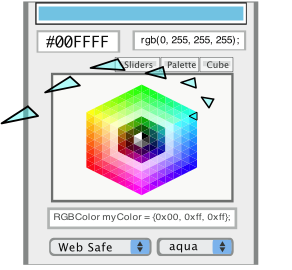 Hex Color Picking: Pick a color with the mouse, paste the HTML hex code, no typos, no counting to 6, no crib sheets - immediately visualize the color. Drag and drop full code snippets: pick a color with the mouse, drag the corresponding color specifying statement to your source code - zero typing, no compiles to "see" the color. Copy a color text specifier from your source code to WebColorPicker and immediately see the actual color with confirming matches to a master color list. WebColorPicker: developed initially for EazyDraw users; now a must have utility for web designers and software developers; a versatile RGB color selection tool for everyone. Get the details on WebColorPicker or have a look at EazyDraw the vector drawing application that makes drawing fun on OS X.